Within the body, a glucuronidation reaction during metabolism promotes the elimination of drugs through urine. To accurately analyze drug metabolites, the glucuronide must be cleaved, typically with hydrolysis using an enzyme. Hydrolysis with β-glucuronidase produces a urine sample with a significant amount of solubilized enzyme that must be removed before HPLC analysis. If the enzymes are not removed from the sample, they can build up on the HPLC column over time, reducing its lifetime. β-Gone offers a simple, rapid solution for β-glucuronidase removal that improves assay performance and column lifetime, and reduces mass spec maintenance. β-Gone also offers a better alternative to the “dilute-and-shoot” method in which sensitivity and accuracy are compromised when the sample is diluted. This method also does not remove the β-glucuronidase enzyme; instead it just dilutes the concentration. 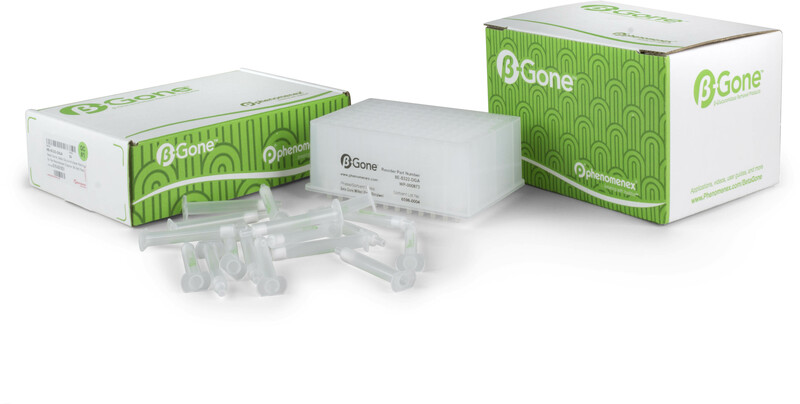 By eliminating the need to dilute the sample, β-Gone delivers a 3-fold increase in sensitivity.